When trying to decide what to serve for dessert, I had a few things come to mind. 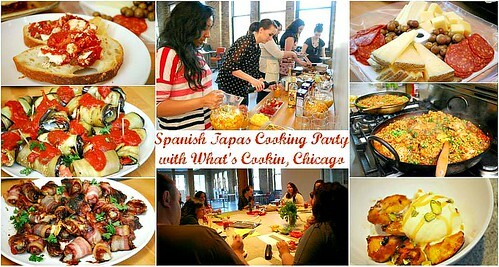 I ultimately chose this dish for the Spanish Tapas cooking party because it was easy and it was my favorite dessert on the menu of one of the tapas restaurants I used to live by in Chicago - Emilio's. It's no longer in business in my old neighborhood of Lincoln Park, but I'm thankful that I snagged one of their menus during my last visit years ago. They served this dish and it was simple, sweet and really finished the meal perfectly. You can substitute the plantains with regular bananas if you cannot find plantains. And if you do have plantains but they aren't fully ripe or black skinned, try placing them in a brown paper bag for a couple days to encourage them to ripen faster in a day or two. Peel and cut the plantains in bite sized pieces on a bias or diagonal. Roll each piece in brown sugar. In a large skillet, heat the oil for frying. When hot, add some of the sugar coated plantains and fry until golden and the sugar begins to melt. Transfer cooked plantains to a serving platter and repeat with remaining plantains. 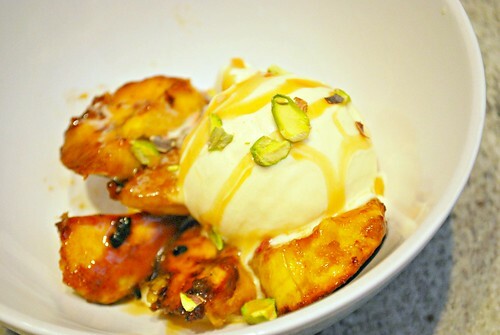 To serve, portion out the plantains to individual serving pieces, top with ice cream, drizzle with caramel and garnish with pistachios. I pretty much want everything you posted this week. Is it wrong to be dreaming of dessert at 7am? Looks interesting. I've never had anything like this before. 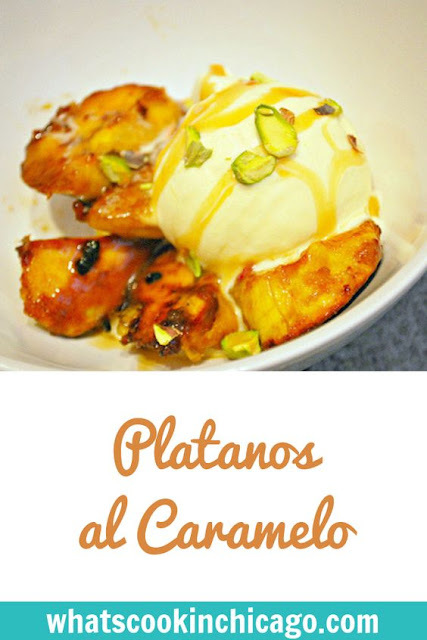 I haven't ever heard of plantains before but you make them sound yummy! This looks really good. I have never ate anything like this but I would love to try it! Oh My goodness! I would love to have this! I absolutely love Plantains!! I have to try this! Ooooh, I am drooling right now! My plantains don't turn out so well - I'm thinking that maybe I need to follow this idea of "overripe"
Yum...we eat plantains a lot here...may have to try this!